Italian peaches are at their best this month. Turn them into a really special dessert with this simple recipe. Serve warm with a generous helping of mascarpone. Preheat the oven to 180°C, gas mark 4. Butter a shallow, ovenproof dish that is large enough to take the halved peaches in one layer. Halve and stone the peaches and set in the dish, cut side up. Beat together the butter and sugar until light and fluffy, about 2 minutes. Beat in the egg yolk. Crumble the biscuits between your fingers into the bowl, then stir well. Spoon a little amaretti mixture into the cavity of each peach half. Pour the orange juice and the liqueur, if using, around the peaches. Bake for 30-35 minutes, until the peaches are tender. Cool for 15 minutes before serving. Serve at room temperature with some mascarpone. Grate a little of the zest from the oranges and stir into a 250g tub mascarpone to serve with the peaches. 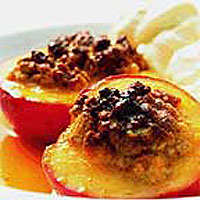 Nectarines can be used instead of peaches if you prefer. This recipe was first published in July 2002.